Why do people believe in faith healing? If you watch video of a faith healer's sermon, you could see people chanting, singing and dancing, and you'll hear the preacher shouting with great conviction. There can be profound emotional outbursts, and when the healer lays his hands on a person, the person often falls or faints. Belief in faith healing is so powerful in part because, before the development of rigorously tested medical science in the 19th and 20th centuries, faith and medicine overlapped much more than they do today. The ancient Greeks, for instance, venerated Asclepius (the god of medicine) and visited a place called an Asclepeion that functioned as a combination hospital, mental health facility and religious shrine. Hierophants, or priests, were also sometimes physicians, and they tended to the sick with both religious rituals and the rudimentary medical knowledge of the day. The modern form of faith healing began in the 19th century and exploded in popularity in the early 20th century, with interest spiking every few decades since. This type of faith healing grew popular largely because of Charismatic Christianity. The word "charismatic" in this case does not refer to the personal charisma of the preachers. In a charismatic religion, adherents experience the power of their chosen deity directly in their daily lives — in other words, they believe that God chooses to interact with humans every day, creating frequent miraculous events. Pentecostalism is the earliest modern form of Charismatic Christianity. Pentecostal churches sprang up in the early 20th century, and their ideas about faith healing and other direct religious experiences gradually made their way into more mainstream Christian sects, like other Protestant churches and even the Catholic Church. Charismatic Christianity surged in popularity in the U.S. again in the 1960s through the Charismatic movement, and has also flourished in sub-Saharan Africa. The direct supernatural interventions of charismatic religion can take many forms — including followers speaking in tongues (known as glossolalia), believing they literally hear the words of God and claiming to see other direct signs of God's will — but two forms are especially popular: being miraculously healed and gaining access to material wealth. There is a great deal of overlap between churches that preach a doctrine of faith healing and those that preach abundance or prosperity gospel — that is, the idea that truly faithful people will become wealthy [source: McKeown]. Some Christian sects, notably Christian Science, believe that medical science is either sinful or not useful. (Christian Science rejects medicine because it is part of the illusory material world, and only the spiritual world is real.) Rather than relying on faith healing in addition to medical science or as a last resort, these sects rely on faith healing practices to the exclusion of medical treatments [source: Sandstrom]. But people don't pursue faith healing only for deeply religious and cultural reasons. People who are severely ill eventually run out of medical options, and in desperation turn to nonmedical possibilities. Faith healing is just one form of nonmedical treatment that appears to offer desperately sick people some hope of a good outcome. The claims of faith healers do seem impractical, and skeptics have challenged them many times. Quite a few healers have evens been caught perpetrating outright fraud. Is it illegal to refuse medical treatment in favor of faith healing? In the United States, legal doctrine gives mentally sound adults full authority in deciding what can and can't be done to them medically, with rare exceptions (like when an unconscious person needs critical, lifesaving treatment, or a patient presents a serious risk to public health). If the patient is not a competent adult, the legal question gets more complicated. In dozens of cases in the U.S., parents with Christian Science beliefs have refused treatment for their children, resulting in negative medical outcomes, including death. 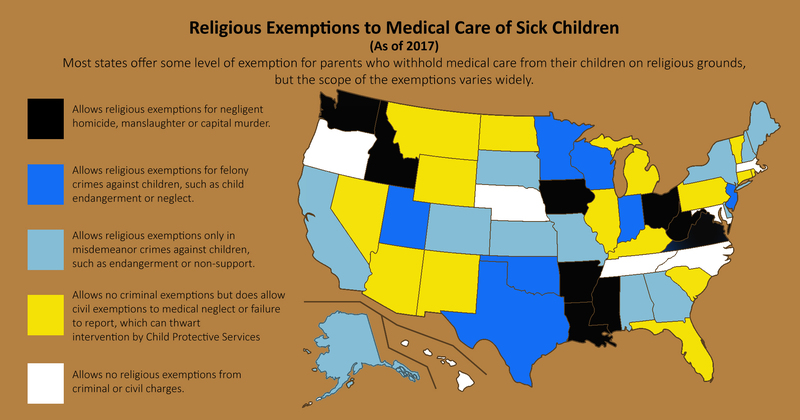 Almost every state has some kind of civil or criminal religious exemption from medical neglect, and nine states have religious exemptions from negligent homicide and manslaughter of children [sources: Sandstrom; childrenshealthcare.org]. This makes prosecution of parents who let their children die due to their religious beliefs nearly impossible — the few cases of successful conviction have happened when parents have allowed multiple children to die this way [source: Coyne]. State legislatures continue to struggle to balance religious freedom with the needs of public health.